National History Day is a year-long education program designed to help students in grades 6 through 12 gain an understanding of historical topics. Students produce dramatic performances, exhibits, multimedia documentaries, and papers based on research related to an annual theme. Over 2,000 students worked on projects illustrating the National History Day theme for the 2003-2004 school year: Exploration, Encounter, Exchange in History. Tatum Holland, Brittany Rice, and Justine Rice of Liberty High School in Bakersfield, California, chose for their topic: "Main Street of America: Route 66 Explorations, Encounters and Exchanges." Their extensive research included interviews with Michael Wallis (author of Route 66: The Mother Road), U.S. Secretary of Transportation Norman Y. Mineta, and descendants of Dust Bowl migrants who traveled Route 66 in the 1930s. They gathered information about Cyrus Avery (the Oklahoma highway official who helped create Route 66), Bobby Troup (whose song "Route 66" told listeners where they could get their "kicks"), the soldiers who traveled the route during World War II, the creators of the television show "Route 66," and others who played key roles in the life of the historic road. Among the many visitors who stopped by to see the Route 66 exhibit was FHWA's Richard F. Weingroff and his assistant Sonquela "Sonnie" Seabron, who had helped the girls by providing research material and copies of documents from his file on Route 66. Left to right, Teacher Dan Peeler, FHWA's Richard Weingroff, Justine Rice, Tatum Holland, and Brittany Rice at the Smithsonian's Museum of American History. Click for larger version of photo. The girls talked with Weingroff about their research into the history and meaning of Route 66, as well as the competition. FHWA's Richard Weingroff enjoys a discussion with Justine Rice, Tatum Holland, Brittany Rice, and Dan Peeler about the girl's research into Route 66 for the National History Competition. On June 17, the competition results were announced. Tatum, Brittany, and Justine received Silver Medals in the Senior Group Exhibit category. In addition, Tatum, who is recovering from bone cancer, received special recognition, including a standing ovation from the other competitors, for her determination to participate in this year's competition and attend the national event. Later that afternoon, Secretary Mineta met with the girls in his office to congratulate them on their accomplishments. 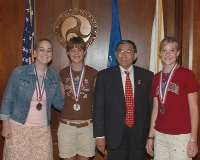 On June 17, Secretary of Transportation Norman Y. Mineta congratulated Silver Medalists Tatum Holland, Justine Rice, and Brittany Rice (left to right) for their success in the National History Competition. The Federal Highway Administration joins with Secretary Mineta in congratulating Tatum, Brittany, and Justine for their extensive research, hard work, and organizational skills.